GENEVA (Reuters) - Sri Lanka must rein in its military forces, prosecute war crimes committed during the long civil war with Tamil rebels and win the confidence of the Tamil minority, the United Nations said on Tuesday. 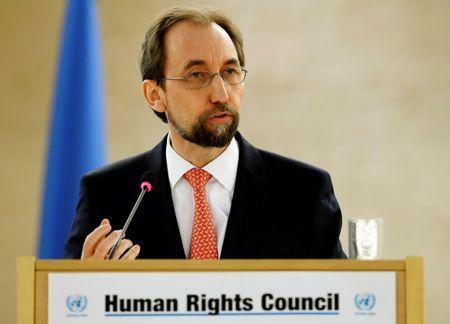 Witnesses must be protected under an effective transitional justice mechanism that should include international judges, the U.N. High Commissioner for Human Rights Zeid Ra'ad Al Hussein said in an annual report. The military and Tamil Tiger rebels - who were fighting for an independent Tamil state in the north and east of the Indian Ocean island - are both likely to have committed war crimes during the 26-year conflict that ended in 2009, the U.N. said last year. President Maithripala Sirisena's government, formed in March 2015, has "consolidated its position, creating a political environment conducive to reforms", but governance reform and transitional justice had lagged, the report said. "The early momentum established in investigating emblematic cases must be sustained, as early successful prosecutions would mark a turning point from the impunity of the past," it said. "Continuing allegations of arbitrary arrest, torture and sexual violence, as well as more general military surveillance and harassment, must be swiftly addressed, and the structures and institutional culture that promoted those practices be dismantled." Deputy Foreign Minister Harsha de Silva said the foreign minister would respond on Wednesday. "But overall, Zeid's report is positive," he said. Sirisena has said that foreign participation is not needed for an impartial inquiry. Many Sri Lankans oppose foreign involvement and supporters of former President Mahinda Rajapaksa believe that U.N. efforts aim to punish the military unfairly. The U.N. Human Rights Council will debate Zeid's report on Wednesday when the government is expected to come under fresh pressure to commit to prosecuting perpetrators. Sri Lanka acknowledged this month for the first time that some 65,000 people were missing from the war. The United Nations and activists have long urged justice for the families of those who disappeared, including those alleged to have been secretly abducted by state-backed groups and paramilitary outfits. At least 250 security detainees were still being held under the Prevention of Terrorism Act, the U.N. report said, noting that Zeid had urged the government during a visit last September to quickly charge or release them. The report voiced concerns over "military engagement in commercial activities, including farming and tourism" and aggressive campaigns in social media that it said "stoke nationalism against ethnic, religious and other minorities".